America is known for natural wonders and Yellowstone is the perfect example of the variety the big country has to offer. 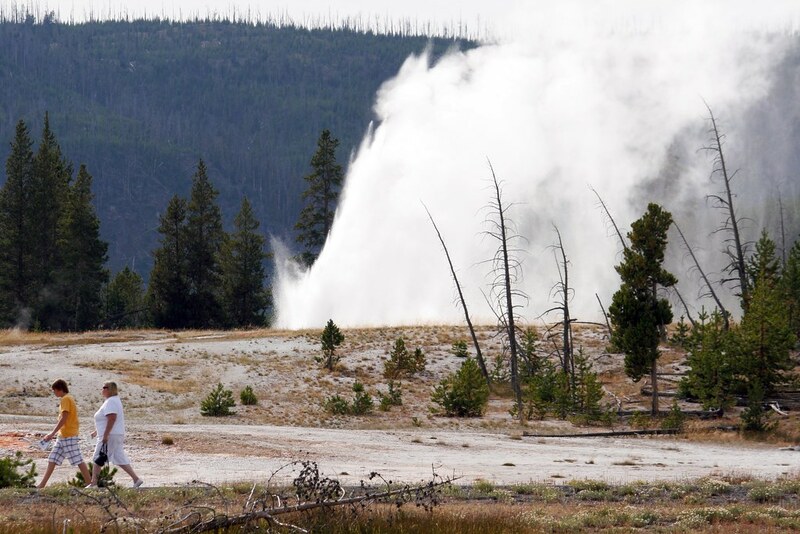 Wyoming’s main attraction houses half of the World’s geysers and you can find grizzly bears, wolves, thousands of bison’s roaming in the park freely. And the show does not end here. 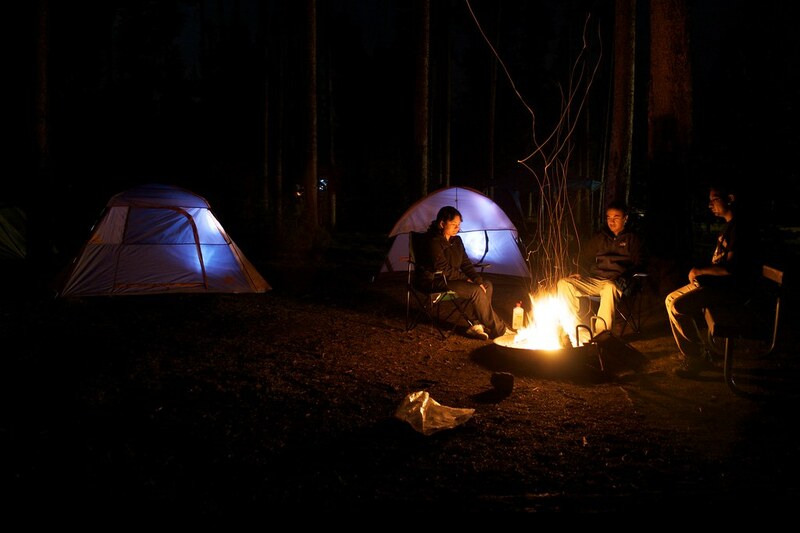 You can enjoy hot springs, geysers, mud pots, acidic pools in the midst of some amazing hotels and campsites. 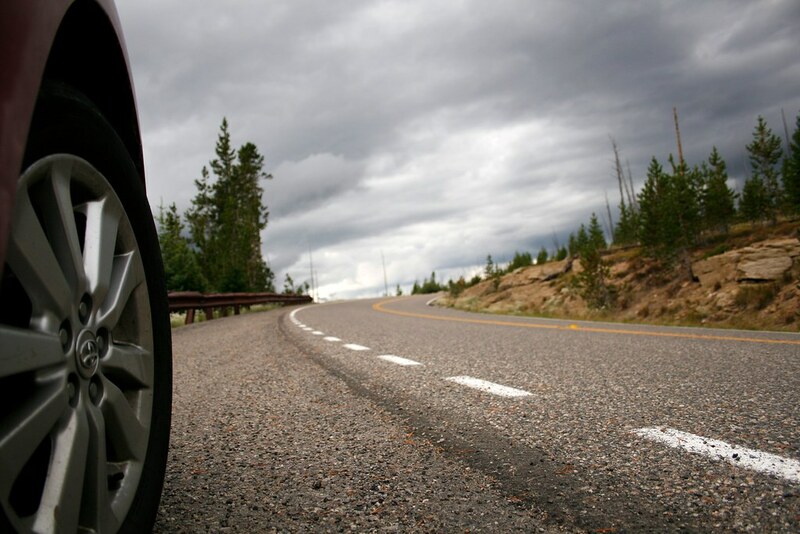 The Yellowstone National Park was on our bucket list during our stay in USA. Finally in fall of 2009 we made the road trip to the wild country from Chicago traversing some 4000 miles over a span of 10 days. We entered the park from the North Entrance where the imposing gate itself mirrored the grand things to come for next three days. Soon after we drove into the wild, we found ourselves in a different era. There were geysers erupting all around and molten lava flowing through as we passed the sign board “45th PARALLEL OF LATITUDE HALFWAY BETWEEN EQUATOR AND NORTH POLE”. After clicking with sign board, we went on and stopped at the Geyser County. 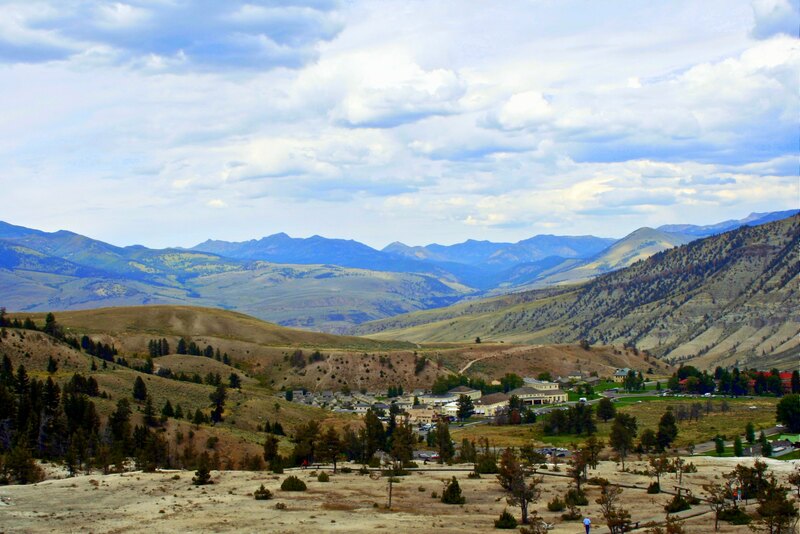 MAMMOTH HOT SPRINGS: Located on a hill, this large complex of hot springs was created as hot water from the springs deposited calcium carbonate leading to terraces of carbonate deposit. Climb up the terrace in the walkway provided and you can see the colorful bacteria that are thriving on the carbonate deposit. 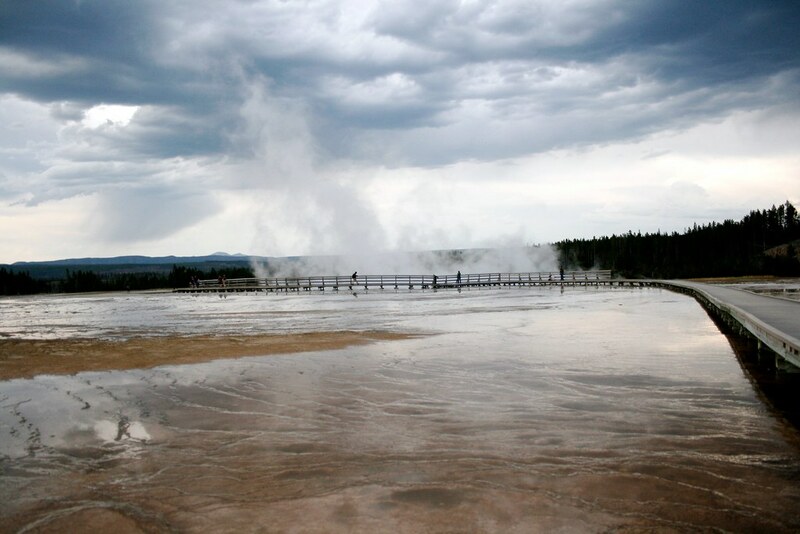 NORRIS GYSER BASIN: We walked through the trail and on both side of us there were active geysers spewing toxic gases. We realized we were inside the active volcanic activity. All of sudden dense cloud covered the whole area and the scene looked surreal. In the horizon the light at the end of clouds formed a perfect backdrop of the rain falling from the dark clouds and the gasses spewing from the ground. Words cannot explain the scene. OLD FAITHFUL GYSER: After this, we headed for some light snacks at Old Faithful Lodge. From this lodge you can have a spectacular view of the Old Faithful geyser erupting around 8000 gallons of water 200 ft. into the air every one and half hour. 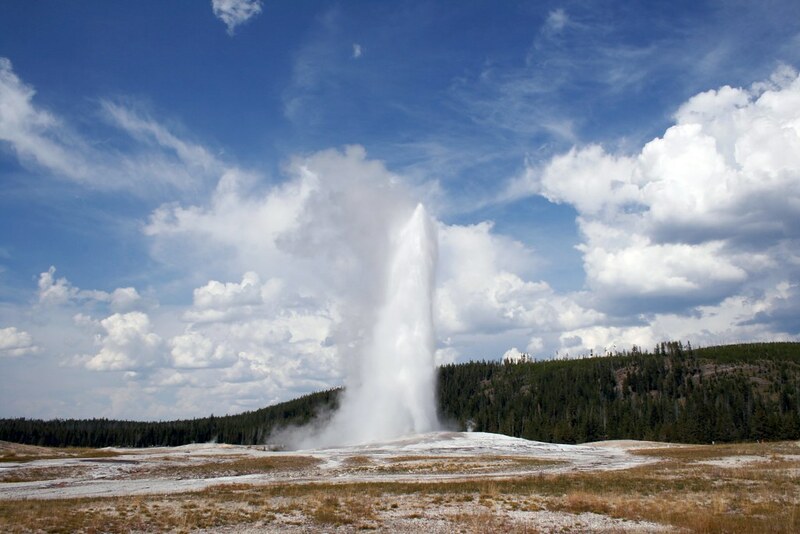 That’s where it gets its name “Old Faithful” from. Getting refreshed we went to the sitting area to catch the Old Faithful geyser in action. We just kept clicking and clicking this awesome activity. It erupted at the perfect time as was mentioned in the chart. YELLOWSTONE LAKE: The Yellowstone Lake is one of the highest (in elevation) and largest freshwater lake in North America. The Fishing Cone and the Big Cone lie in the lake and one can understand the amount of hydrothermal activity going under the lake. 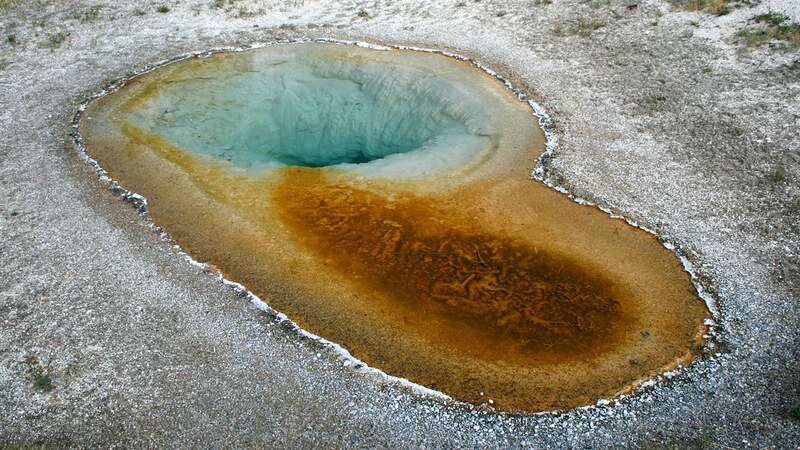 WEST THUMB: Located alongside the Yellowstone Lake is place for some of famous gysers namely the Abyss Pool. The dark green colored water gives the illusion of a bottomless pool. Alost stagnant spring activity have given rise to algae like growth along the edges. 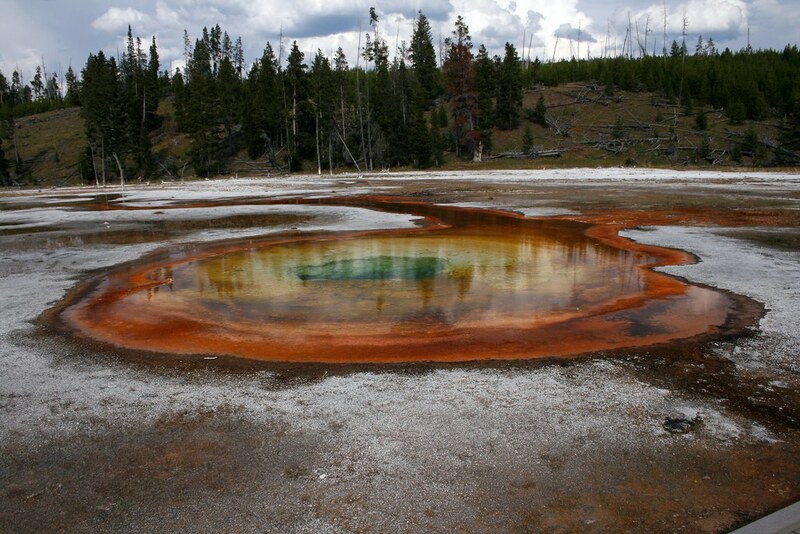 The gysers on the shore of the Yellowstone lake can still fuming sometimes. One can see various colors of the pools in West Thumb which are created by heat loving microorganisms. Colors vary from green and brown in cooler water to orange and yellow in hotter water. Calling off for the day we went to our hotel for a good sleep to get recharged for the next day. TOWER FALL: The next day was welcome to the Tower waterfall which is the most famous waterfall of Yellowstone and enjoy a colorful rainbow as you hike the steep walk towards the base of the fall. GRAND CANYON OF THE YELLOWSTONE: THough much much smaller than the Grand Canyon of Arizona, it still breathtaking. View the towerfall at a distance flowing amongst the canyon as you click some nice photos with a rainbow in the backyard. THE LOWER BASIN: This gyser basin is fairly a large area on both sides of the road with erupting gysers, hot springs and mud pools. 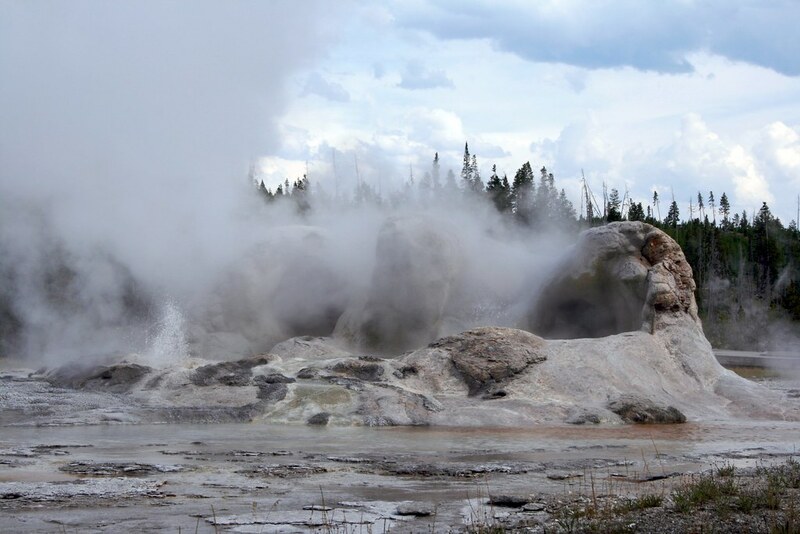 You are sure to catch one or two live erupting gyser for the hour you are going to spend at this area of the park. 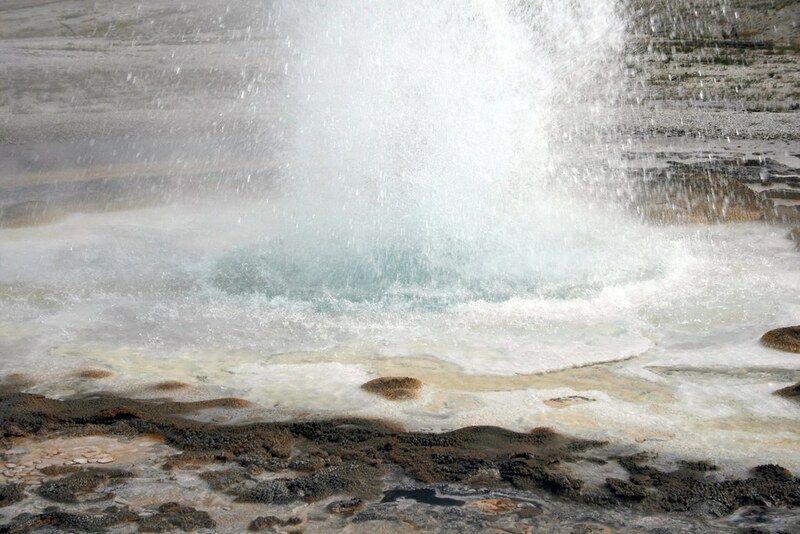 Stand on safe distance from the gyser when its erupting and you capture some precious moment of life. The Giant Prismatic Spring is the most spectacular feature and its colors are stunning. Similarly there are quite number of hot springs in this part of the park with colors distinctly different from each other and each more beautiful than the other. THE LAMAR VALLEY: This area is a must for wildlife lovers. 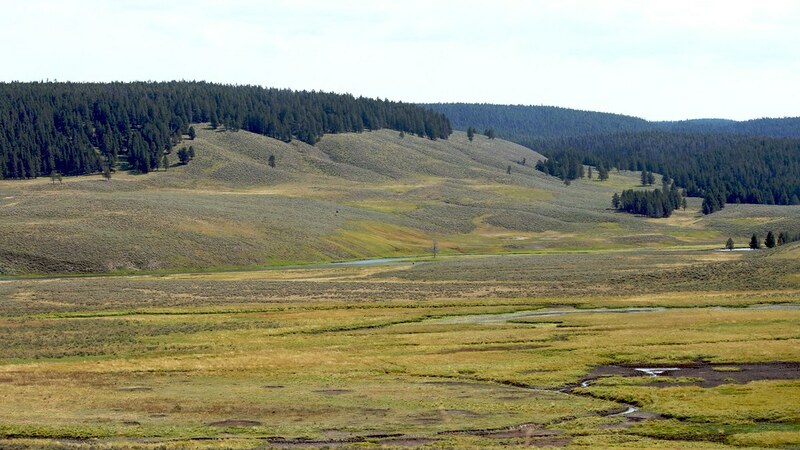 Spot some elk, bison, grizzly and wolves here. We were leaving Yellowstone National Park and on the way to Grand Teton National Park when we meet with atleast 1000 bisons heading in a queue in a short distance. We stayed safe and clicked some pics before leaving the park. 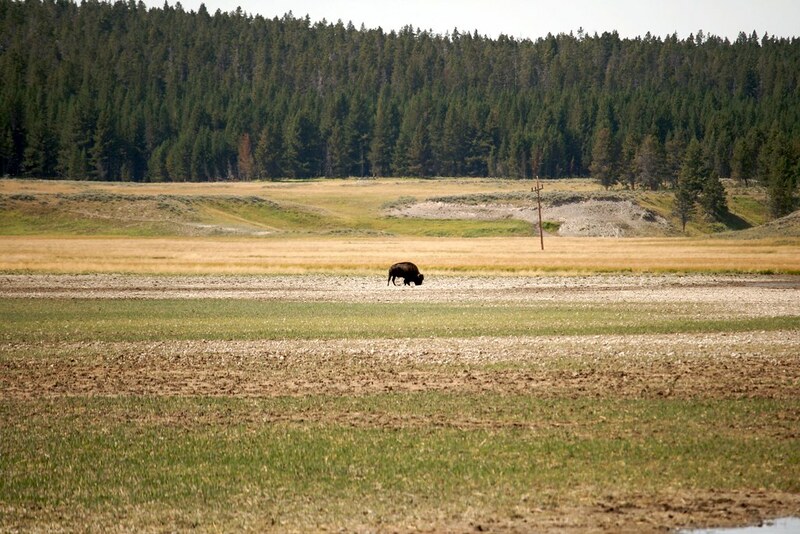 The ending scene made this trip so much more memorable with the bison herd still lingering with the thought of this spectacular Yellowstone National Park. Our take on Yellowstone National Park: Since we have only been to the lower 48 till now, we rank this place as the best of the lower 48. Someday we hope to explore Alaska (Denali and Arctic) and hope to see even better naturescapes.